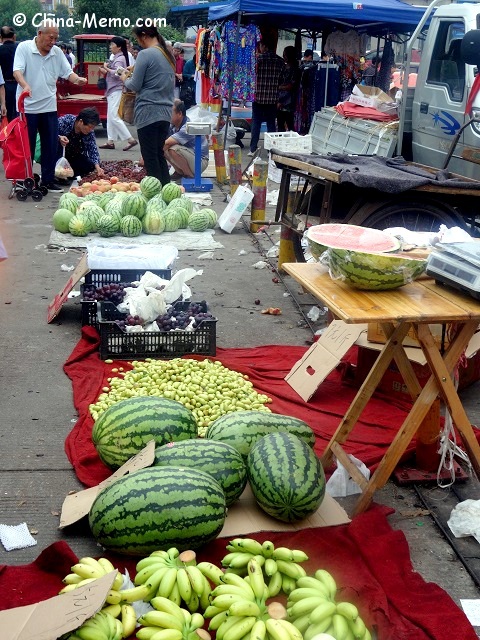 Unlike the indoor market which is located inside a building, the street market is just along the sidewalk. Therefore there is no fixed stands for the vendors. 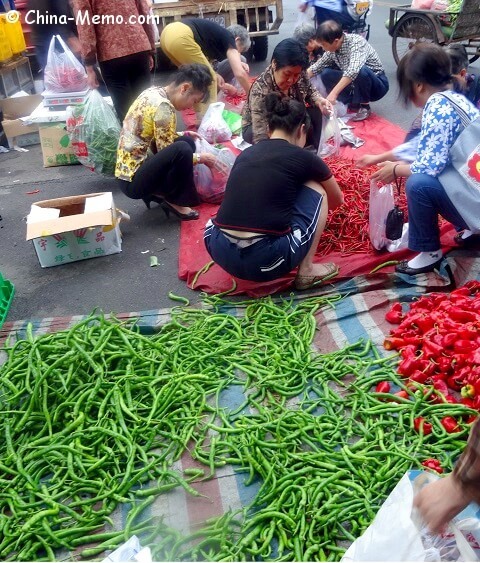 In my hometown, the street market is located outside of the indoor market building. 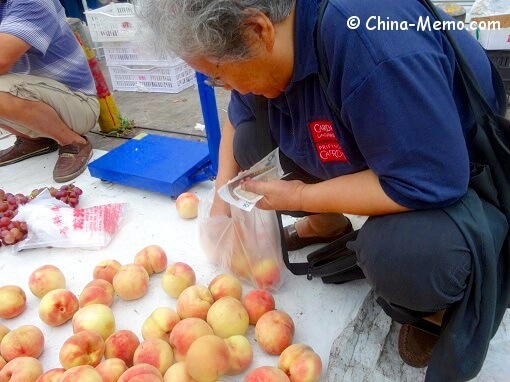 Due to the environment protection, the street market is only allowed to open in the morning. 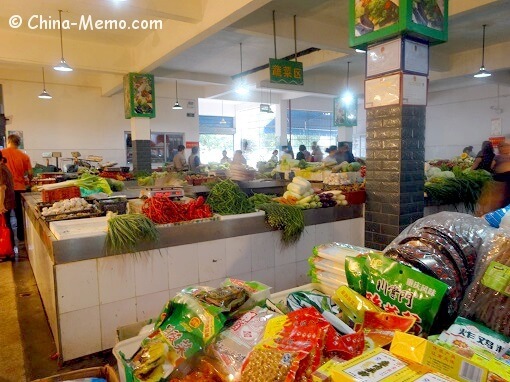 After it is closed, people can still buy food from the indoor market. 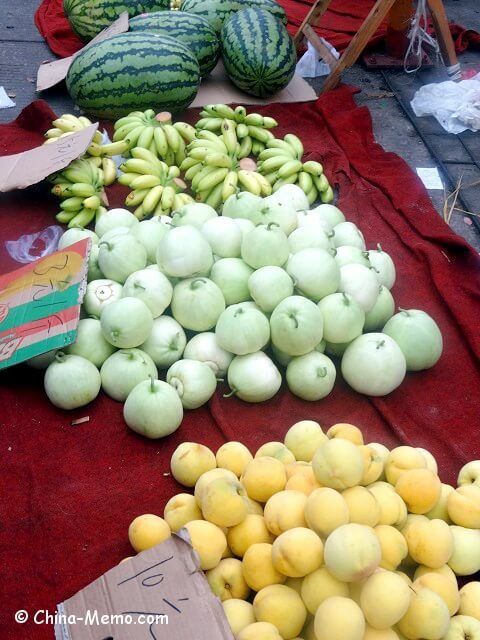 All food in the street market is freshly brought here by vendors. 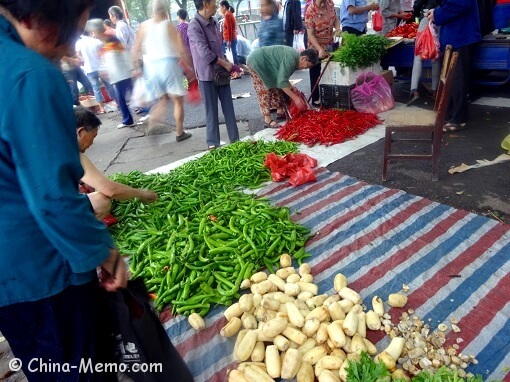 Some vendors are the middlemen, but most of them are the farmers, who grow the foods in their field and sell them to the customers at the street market. 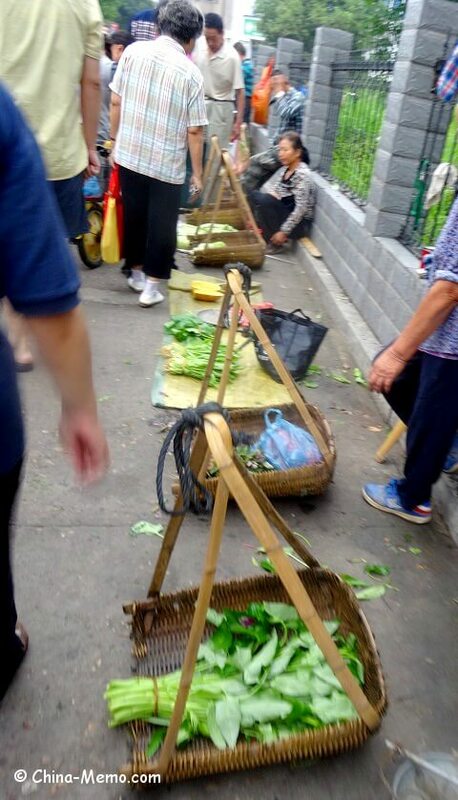 Since there is no food stall, most foods are just placed on the ground. The food is either placed on top of the cloth or the plastic layer. 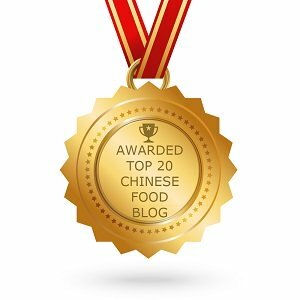 Customers can select the food they like, of course, from the ground. So no fancy dress here, wearing casual is normal and better. 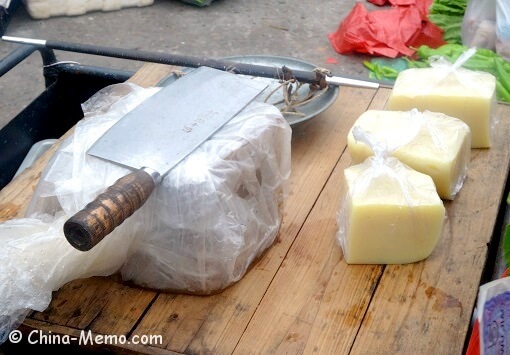 Vendors have to use their own tools to bring food to the market. Some really come with the clever ways. 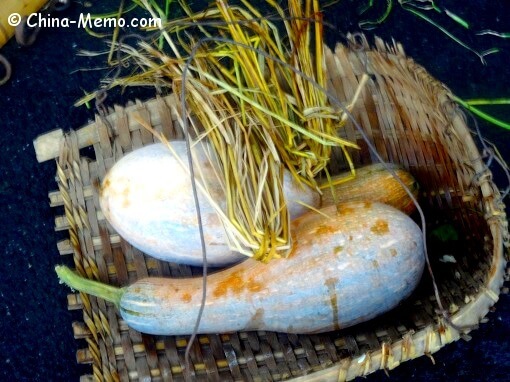 For example, I don’t know what this basket is called in English, but you can see it is convenient for farmers to carry their vegetables. 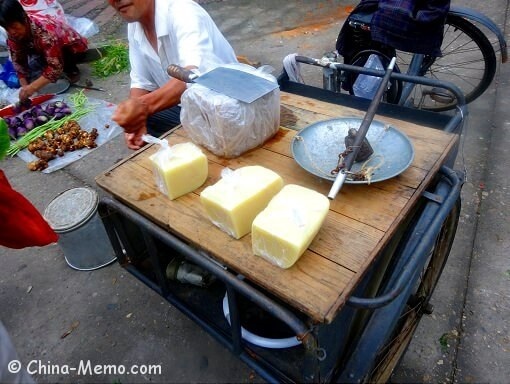 In this picture, this man uses a tricycle, which is not only the transport but also used as his food stand. 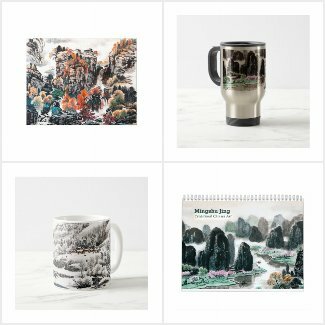 Really handy, isn’t it? 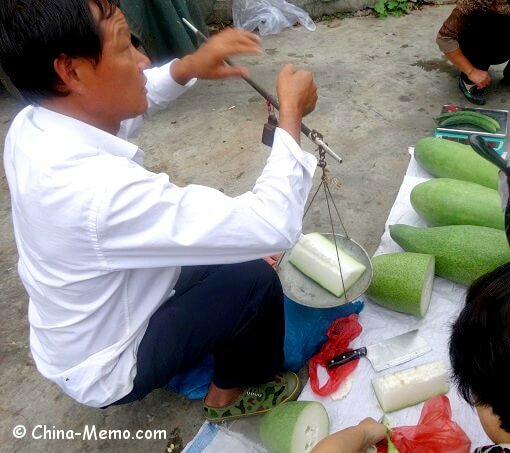 He is selling the local made rice tofu. I have a cooking video for this, will post on my Youtube channel in the future. 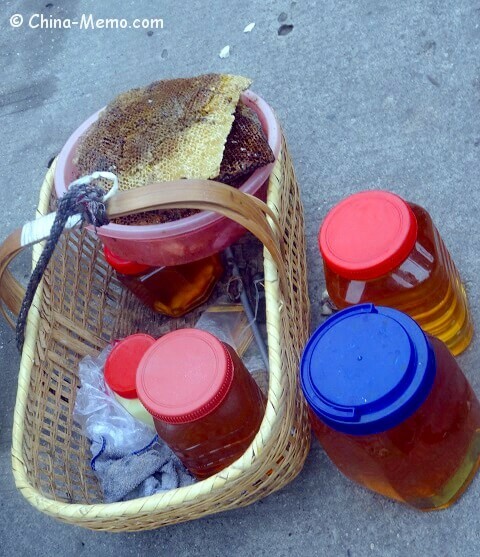 The basket is definitely convenient to carry the homemade honey! 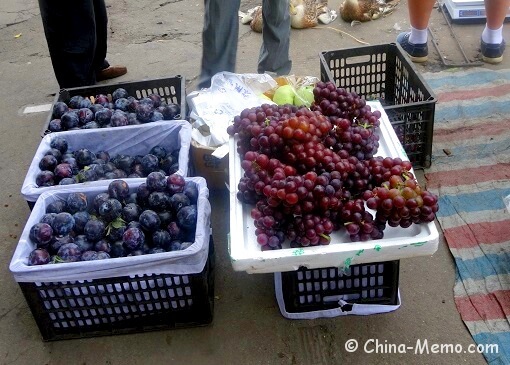 Fruits such as plums and grapes are put in the boxes. 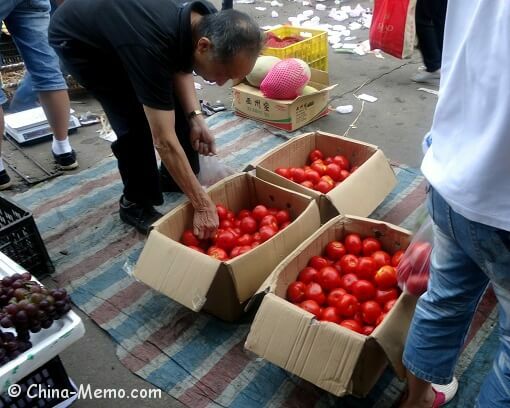 A man is picking the tomato from the box. 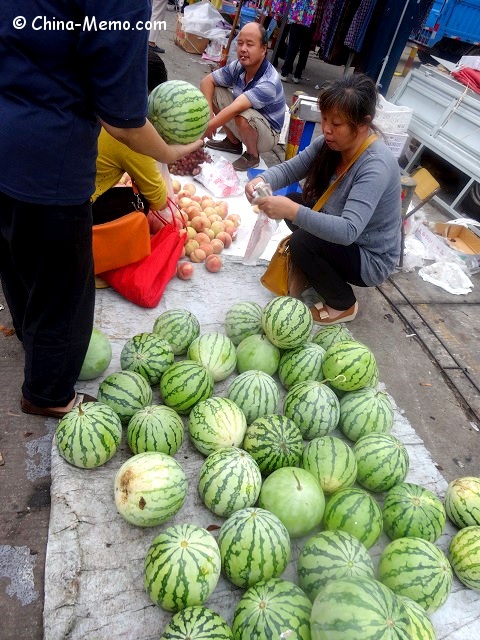 In the summer, water melons and white melons are very popular. 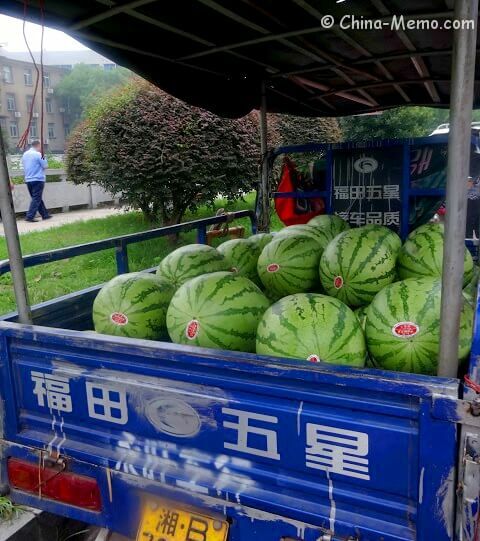 Of course, you can guess these water melons are coming from a place far away from here, as they are carried by a motor car. Some farmers use the electronic scale, but many still use the traditional scale to weight the food. 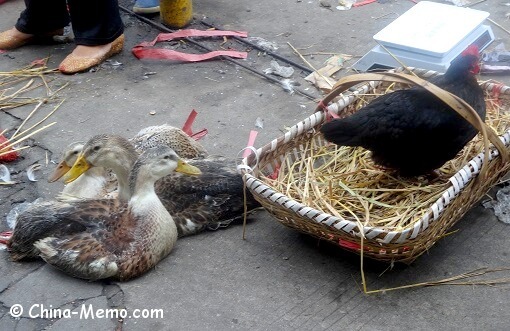 You can find the ducks and chicken here, live :), and fresh eggs as well. 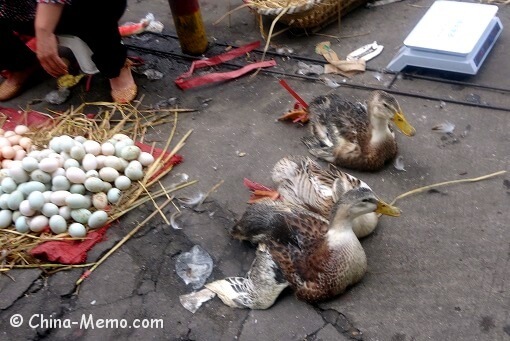 Interesting, a local is selling the salt-covered quail eggs, which I had never seen before. The board behind says these eggs are very nutritious. The frogs are packed in the web. 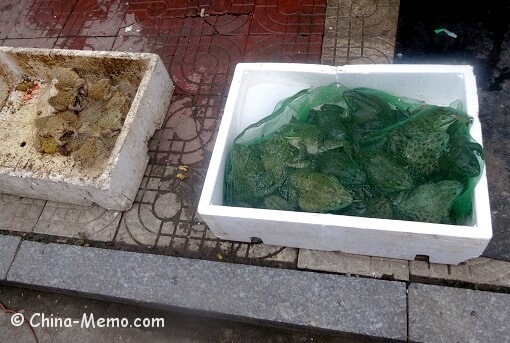 The frogs in the left side are from the field, the ones in the right are much bigger, called Niu Wa. 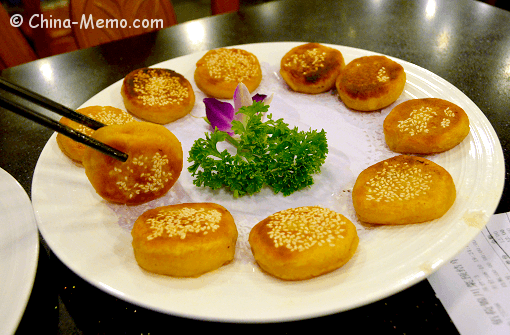 Hunan locals like to make the hot spicy frog dish, very tasty. Normally once you buy the live animals, they can help you to prepare them as well. 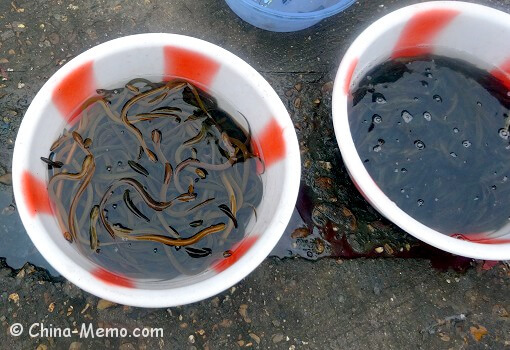 For example, these are the eels. 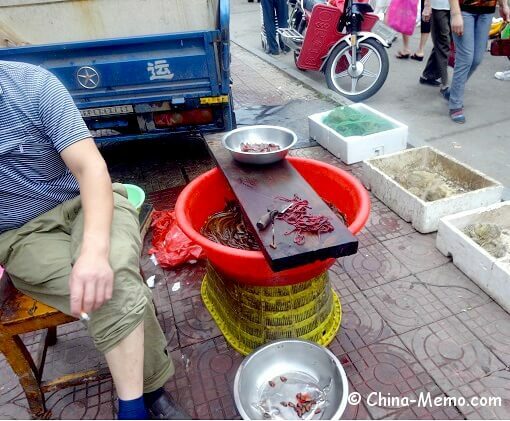 Beside them, you can see a man can help you to prepare and “clean” the eels, make them ready to cook. 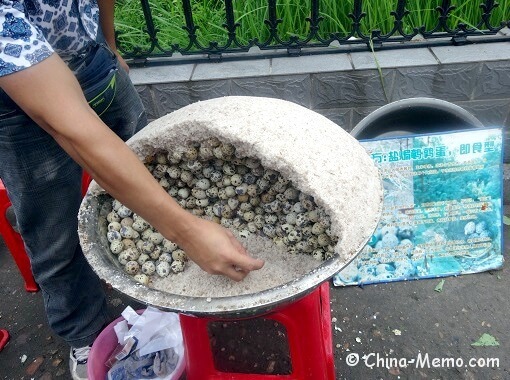 If you are interested, you may watch one of my videos, which shows you how Hunan local clean and cook the eel dish. 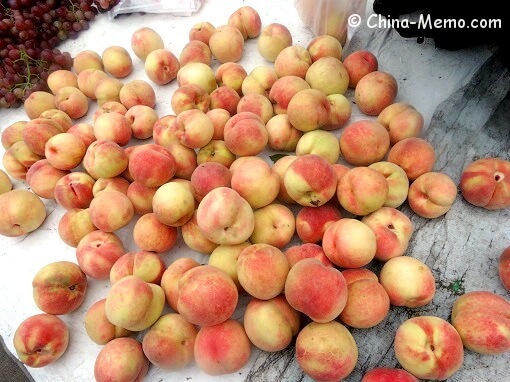 To be continued, China Local Food Market (3). 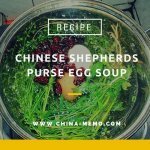 Hope you like this page for China local food market, please share with your friends, Like it on Facbook or share on Twitter!